When it comes to dietary fat, there are essentially 3 main theories regarding their inclusion in a diet designed for weight loss. Basic Philosophy: Fats should be greatly reduced, especially saturated fat. The small amount of fat permitted should come predominately from vegetable sources. Basic Philosophy: Fats from almost all sources can be eaten and in fact, are encouraged. Dieters should focus on eliminating carbs from the diet instead. Dietary fat doesn’t turn into fat, excess carbs and sugar do. Basic Philosophy: Dieters can eat fat, but they should only be healthy fats. Healthy fats are those found in whole foods or ones that can be cold pressed. Processed fats and oils are usually high in omega 6 fatty acid, which promotes inflammation and fat retention. Probably somewhere in the middle. Should fat be a dominant part of the diet? Probably not. Should processed vegetable oils be avoided? Probably so. Are fats important for a healthy body? Definitely. Fats are an important part of the diet, but they should be as natural as possible just like every other part of a healthy weight loss diet that focuses on whole food nutrition yet avoids processed foods. Choose fats and foods that take the least amount of steps to get from the source to your mouth. Some foods contain fats that are more beneficial than others. Learn to make good choices by using the list below. 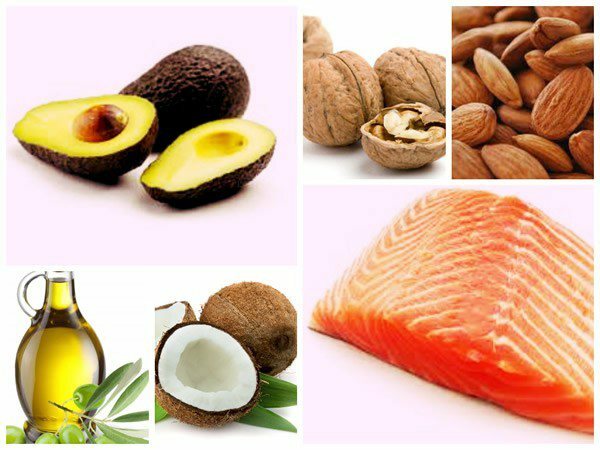 Healthy fats are those that are as natural and unprocessed as possible and those with a good fatty acid profile that helps reduce inflammation within the body. As research has progressed over the last few decades, the once held-dear belief that saturated fat = heart disease has been questioned. The link between the two has become increasingly tenuous. The relationship between dietary cholesterol and blood cholesterol is nowhere as straight-forward as what we were told in the 80s and 90s. In reality we all respond differently to dietary cholesterol, and in most of us, it doesn’t affect our blood cholesterol (source). The rush to eliminate saturated fats from our diet has lead to an increased consumption in processed carbohydrates. It is THIS that is contributing to increased cardiovascular disease risk (source). In light of this research, it has become clear that it is okay to consume saturated fat in the form of butter, eggs, and grass-fed beef. As with all fats, realize that they are more calorie dense that carbohydrates or protein. However they do satisfy hunger better than sugar! These fats are highly processed and pose possible health risks on the human body. Their fatty acid profile can cause inflammation throughout the body. Processed vegetable oilslike soybean oil, corn oil, canola oil, sunflower oil, safflower oil. If in doubt, choose foods that are unprocessed or minimally processed and that contain low levels of omega 6 (Linoleic acid). Eat only foods with zero trans-fats and don’t trust the label. Foods with .5g of trans-fat or less can claim 0 trans-fat. Check the food’s ingredients for the word “partially hydrogenated” or “vegetable shortening”.